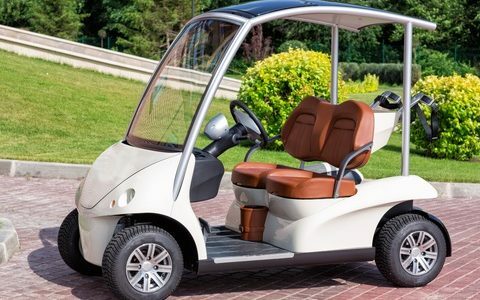 Each year, about 13,000 golf cart-related accidents require emergency room visits, according to the U.S. Consumer Products Safety Commission, and that number rises year after year just as their popularity does. Nearly half of those accidents involve children under the age of 16, half of which are caused by a fall from a moving golf cart. Apparently, many news reports of such accidents use the term ‘freak accident,’ according to Krisopher Seluga, a mechanical engineering and safety expert. “It’s not. It happens all the time,” he said. Studies conducted by Seluga using golf carts and child-size crash test dummies suggest that many ejections occur during left turns. Children, according to Seluga, are susceptible to falling because of their small size and lower center of gravity. Younger children aren’t strong enough to hold on to the railings that help adults, which actually acts as a fulcrum for them. It causes them to go up and over during a left turn, increasing the risk of a head-first landing. Seluga suggests forbidding anyone whose feet don’t rest on the floorboard to ride unless they’re seat belted in. On the flip side, the safety benefits of seat belt use in golf carts are disputed by Fred Somers, the secretary for the National Golf Cart Manufacturers Association. Somers argues that people need to be able to exit the cart quickly in the event of a rollover, which could result in passengers being crushed if there isn’t a crush-proof canopy installed. Seluga is not aware of any deaths caused by rollovers in which riders were wearing seat belts, but agrees expecting golfers to wear them on the golf course is unrealistic. The Low Speed Vehicle category was created by the National Highway Transportation Safety Administration in 1997 as more and more golf carts began being driven on the streets. Vehicles capable of reaching 20 to 25 mph are required to have seat belts and other safety devices. NHTSA includes golf cars and personal neighborhood vehicles in this category. Golf carts used on the streets that go slower than 20 mph are the most popular because they’re more budget-friendly and aren’t regulated unless specific local or state governments have implemented laws or ordinances. Golf Cart Safety by Metrolina Carts.